Quincy Tyler Bernstine, Jennifer Kim, Thomas Jay Ryan, and Kyle Beltran in The Amateurs. Photo by Carol Rosegg. BOTTOM LINE: The Amateurs is a play about survival and the art we make in order to get by. Playwright Jordan Harrison concocts a world of the plague-ravaged Dark Ages fresh from the theatre history textbook that you skimmed in college. 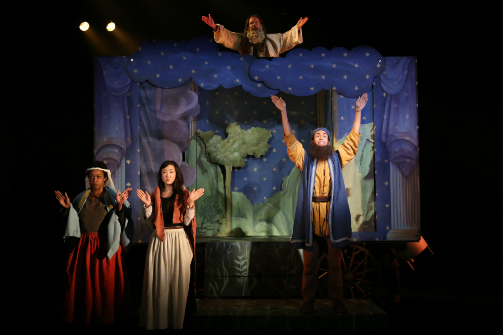 This is the era of pageant wagons and plays about the Bible—the only source of medieval entertainment. David Zinn’s stark, impactful scenic design fills the floor with black piles of dirt—or is it ash?—and a massive wagon designed with contraptions of levers and rope that can raise clouds into the air, waves from the floor, all in glorious, contrastingly colorful 2-D. While the era is achingly different, we know these amateurs. This is the local community theater you had back home, with just a little too much enthusiasm and a lot less talent. Oliver Butler’s direction of the players is never condescending, but as scenery falls apart, actors go off script. More dramatically, actors die from the Black Death. Just like at that community theater, the show must go on. Thomas Jay Ryan’s Larking commands the show by looking for an immediate replacement for an upcoming performance for the Duke. He’ll be watching from a hole in his bedroom wall for fear of the plague. The wagon marches on until a mysterious, black-cloaked figure arrives for another victim. That’s when Harrison’s play takes a sharp turn. Abruptly he appears as "himself," though played (with man-behind-the-curtain realness) by Michael Cyril Creighton. He’s awkward, apologetic, and subtly femme with hipster/Brooklyn style. Coming from the plague-ravaged pageant wagon world it’s a welcome respite of familiarity. But this is also where Harrison’s play begins to feel like two plays mashed into one. Creighton-as-playwright tells us about growing up gay in the '80s in science class. The topic turns to "cooties" and their much more serious real-world version, AIDS. Here, he talks about coping in a much different way: coming to know himself as an artist in a world where another modern plague is rapidly dominating a population without answers. It’s moving, but doesn't particularly shine anything new on the topic. We’re tossed back and forth between Harrison’s intimate storytelling and the players acting out the scenarios in the same presentational manner, middle-ages garb contrasting with Creighton’s plaid (designed by Jessica Pabst). The stark style difference is nice—Harrison’s work frequently plays with contrast and worlds of his invention—but I struggled to understand how these two worlds related. As events unfold quickly with not much reflection, often playing out as an ancient melodrama, I struggled to care about Harrison’s characters. The Amateurs feels like a draft of a play that just made it a little too far. The Amateurs is by Jordan Harrison. Directed by Oliver Butler. Scenic Design by David Zinn. Costume Design by Jessica Pabst. Lighting Design by Jen Schriever. Original Music and Sound Design by Bray Poor. Production Stage Manager is Rachel Gross. The cast is Kyle Beltran, Quincy Tyler Bernstine, Michael Cyril Creighton, Greg Keller, Jennifer Kim, and Thomas Jay Ryan.